If you’ve read my post on The Fall of Five, you probably know I was a tad frustrated with how things ended. If you read the actual book, you likely share my frustration. 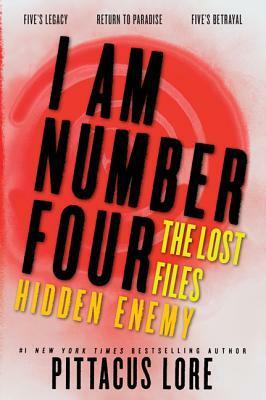 Well, in Hidden Enemy, we get a little more information on what made Five the person he came to be. Return to Paradise, the second novella in this book, is told from the perspective of Mark James. You may remember him as the jock who made Four’s life miserable. He was also Sarah’s ex-boyfriend. Well, you may also remember that he had a rather huge change of heart during the battle at the end of I Am Number Four. This story picks up during the aftermath of that battle. Mark can’t really go back to how things were before. He knows too much now. How can he be expected to care about partying when evil aliens are bent on enslaving humans and destroying the planet? He knows more is going on than the public is aware of, and the only person who he can talk to is Sarah, a girl who is still maddeningly hung up on her alien boyfriend, the guy who dragged them into this mess. Mark also does some investigating of his own, and he discovers that the Mogadorian threat goes deeper than he realized. Can he, a mere human, do anything to stop this? And what will happen when Four returns to town and Sarah goes missing? Is there any way Mark can help Sarah and the Lorien cause? At any rate, I’m now more than ready to dive into the next full-length novel in this series, The Revenge of Seven. It’s sitting on my coffee table right now, just waiting on me to pick it up. After I finish one more read-in-progress, I’ll journey once more into the fight between the Loriens and the Mogadorians. From what I’ve heard, there will be just one more book after this one, so I’m sure The Revenge of Seven will illicit the same response that The Fall of Five did. I’ll likely want to hurl it across the room at the end. I’ll let you know how it goes. Spoiler alert! You MUST read Jessica’s Guide to Dating on the Dark Side by Beth Fantaskey before proceeding! You may also want to read The Wedding of Antanasia Jessica Packwood and Lucius Valeriu Vladescu, an online novella available on the author’s website here. 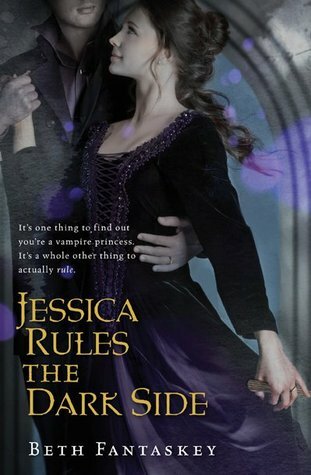 This post will be all about Jessica Rules the Dark Side, which takes place shortly after the events of the novella. After reading both the preceding book and novella, I had super-high hopes for Jessica Rules the Dark Side. In some ways, those hopes were realized. In others, though, this sequel just didn’t live up to the first book. I liked how Jessica grew into her role as a leader, but I wanted to smack her in the face a few times for being monumentally stupid. She was such a strong character in the first book that it was almost painful to see her weakness at the beginning of this one. Yes, I understand that there’s probably a lot of pressure involved in being a Romanian vampire princess, but the first part of this book was kind of difficult to take. Jessica was almost as whiney as Bella Swan (and that is saying something). The honeymoon is over. Now, it’s time for Lucius and Jessica–otherwise known as Princess Antanasia–to rule their contentious vampire clans. But not everyone wants them to take the throne. When one of their primary adversaries ends up dead, and all evidence points to Lucius, it is up to Jessica to make the hard decisions and step up when her dear husband is incarcerated for a crime she’s sure he didn’t commit. Jessica doesn’t know what she’s doing, and, worse, everyone knows it. How can she possibly find a way to clear her husband’s name and convince everyone she’s fit to be the queen…especially when she doesn’t think she’s queen material herself? Jessica enlists the help of her best friend Mindy–who’s dealing with her own brand of failure–and Lucius’ best friend Raniero–who is hiding some pretty dark and disturbing secrets. Jessica has complete faith in Mindy, but she’s not quite sure of Raniero’s motives…and when the truth is revealed about his past, she’s even more unsure. Eventually, she trusts Lucius’ faith in his friend and seeks Raniero’s guidance and help in proving her husband’s innocence. Jessica is still not entirely certain of who around her is ally or enemy, but it’s becoming crystal clear that a plot is afoot to remove Lucius–and her–from their rightful places. But who would go to such great and horrifying lengths to destroy Lucius and Jessica? The answer is closer than even Jessica knows, but time is running out. Lucius’ time in prison–without the life-sustaining blood he needs–is causing him to grow ever weaker. If Jessica cannot find out who is framing her husband soon, both of them will face certain destruction. Who is friend? Who is foe? And can Jessica learn to tell the difference before she loses everything? Will Jessica find a way to save her husband and assert her own power before it’s too late? Or will the traitor that framed Lucius find a way to destroy Jessica too? Uncover the mystery when you read Beth Fantaskey’s Jessica Rules the Dark Side. It was clear to me from the very beginning who was behind the shenanigans in the Vladescu manor, but several of the characters in this book–with the possible exception of Jessica’s best (human) friend Mindy–were blind to what was obviously going on around them. It was all so predictable. While reading this book, I couldn’t help but draw parallels to that other vampire couple. You know, the sparkly one. The relationship between Lucius and Jessica is very similar to the one between Edward and Bella. No, they didn’t have some weird, creepy mutant child, but their dynamic was basically the same. Lucius is the powerful one who seems secure in his role as a ruler. He’s dominant, formal, and protective. Jessica is new to this whole thing and is very insecure and whiney. She eventually grows into her power, but it takes a very real threat to make that happen. By the end, she is Lucius’ equal, but the journey was not easy for her, and she had to overcome her own urge to run in order to truly rule. Very much like Edward and Bella in Breaking Dawn, no? I was a big fan of Jessica’s Guide to Dating on the Dark Side, but I’m afraid this sequel didn’t quite live up to my expectations. It was okay, but a few surprises would have made it a much more exciting read. If you’d like to learn more about author Beth Fantaskey and her books, visit http://www.bethfantaskey.com/.